What should a Stock Trader expect in this budget? May be out of my Budget! Was the Union Budget 2014 a showstopper? Needless to say it’s a special event and has a unique reason every year. It was BJP’s promises at stake and they have saved it to some extent. For the first time in many years, the budget promised as much as can be delivered by the Mr. Modi led government. Mr. Arun Jaitley, the current finance minister, was realistic in his approach of pointing out the mess that the financial condition of this country is in and the jeopardy if it doesn’t get out of it. Watching a budget session is nothing more than watching a thrilling movie with lot of twists and turns, moreover we had an interval too this time! Mr. Arun Jaitley the protagonist of the movie has rightly identified soaring fiscal deficit and has set passionate target to bring it down. I use the word passionate here, as he is expecting India’s GDP to expand by spending less. May be the government is asking its people to work hard, increase efficiency and curb the leisure expense. Cigarettes and tobacco products have had their share of limelight in the past and this time was no exception as the excise duty was increased from 11% to 72%. Increasing their price every year has helped in reducing the consumption but it has reached a point where cigarette smoking is now considered as a leisure activity and a status symbol. He can afford a car if he is able to blow up a pack of cigarettes every-day. A Social Media Post had described the situation aptly: “A guy was showing off his latest Iphone. I took out a Gold Flake Kings and lit it up. He went away in shame”. A whooping increase in excise duty is certainly going to have a positive effect on smoking statistics. However, Mr. Modi must keep a check on illegal trades. 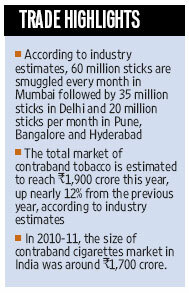 According to the data, contraband cigarettes market grows in conjuction with every increase in excise duty. Mr. Modi has certianly given us an option to cope up with it. Sit back, relax and spoil yourselves on weekends while you watch movies on your new LED/ LCD TV’s. Cutom Duty reduced to NIL from 10% on LED and LCD TV panels!! Modi has also made husbands happier by reducing excise duty on footwear. Well thinking again, shopping bills are never going to go down and wives will end up buying more articles out of the saved money or may be two pairs of sandals instead of one!! Nevertheless this will ceratin give a boost to India’s footwear industry. Even the Students are Happy! No need to get disappointed if you are not able to make it through one of the IIT’s or IIM’s. You can wait until the government announces setting up of new institutes. Coaching classes would happily welcome it because this would certainly help them to come out with a good number of students making it to IIT’s/IIM’s and their brochure gets lengthier. 5 new IIT’s and IIM’s are certainly going to churn out more educated crowd with a baggage of expectations. Probably Mr. Modi is setting up multinational companies in India in the coming years and India is feeling the dearth of talent already. This is certainly going to boost education sector but should not be at the cost of quality whereby these new IIT’s or IIM’s would be overshadowed by local ones. However, Mr. Modi should also have done something for the faculty shortage rather than increasing the ratio of students per teacher. The introduction of Bullet train has created a stir among people. The people would now have another option to travel to Ahmedabad from Mumbai whilst saving time too. A hike in rail fare (about 14%) to improve rail statistics and an ambitious plan of about a project costing approximately INR 60,000 Crore sounds too heavy to digest. The Dedicated Freight Corridor Project, an initiative taken by UPA government, was not spoken much about. A bullet train project normally takes 8-9 years, however this being implemented in India, we can certainly expect 5 more years along with an uncertainty of completion if the government changes. A Sum of 100 Crore towards BetiBacho, BetiPadhaoYojna, sum of 150 Crore on a scheme to increase the safety of women in large cities and here you go…….INR 200 Crore to build a statue of Sardar Vallabhai Patel in Gujarat. Yes that’s right, may be the Iron Man of India would be ashamed of this if he would have been alive. Increase in FDI in insurance and defense sector – A Bold move. Increase in investment limit under 80C from 1 lakh to 1.5 Lakhs – a double booster along with increase in income tax exemption. At first glance the budget looks a little conservative but after giving it a closer look one feels it is promising. Government signals are clear; it wants to create an environment for private sector investments into infrastructure and manufacturing to boost the economy. It is now important to watch how these ideas are implemented and taken ahead. Mr. Modi has not only won many hearts once again, but has also given us hopes to see a better, stronger and an investment friendly Bharat.